Or, in RStudio, go through menu Tools, Install Packages. You only need to install the BEST package once. The functions for BEST are now in R's working memory. You need to do this command every time you invoke R.
to display a help file with a complete example of using the functions. Further documentation is available in this PDF that Mike prepared. Please note that the syntax of Mike's R package is a bit different than the original BEST programs. Perhaps the best way to learn the new syntax is to run the examples provided in the help file and PDF. If you like the package, please let Mike know; his e-mail address is shown in the help files.
? As long as you have a working internet connection, this should work on Windows, Linux, Apple OS etc. Dear Anonymous: Thanks for the comment. When I originally created the post, the binaries were not yet on CRAN. But now they are, and I have updated the blog post. I've bought your book and have begun the process of converting myself over to Bayesian. I was wondering if you had any opinions on BLOG (https://sites.google.com/site/bloginference/). Or should I just learn JAGS instead? And thanks for getting the book. I hope it serves you well. any suggestions for how I can get it to run would be gratefully received. It works for me... Perhaps try a different CRAN mirror site. Thanks. For what it's worth, it seems the problem was that I hadn't updated R on my machine in way too long. After installing the current version of R, I had no problems getting the package. First thanks for making all this available as packages and the theory. It is much a appreciated! My question is if the BEST can be used where one would used a paired t-test? e.g. repeated measures. Sorry if this is in the book, I have just started reading it. I can't point you to papers describing a Bayesian analysis of ANOVA-type models, but I will indicate sources with advice and pass this on to John Kruscke who may have more references to hand. 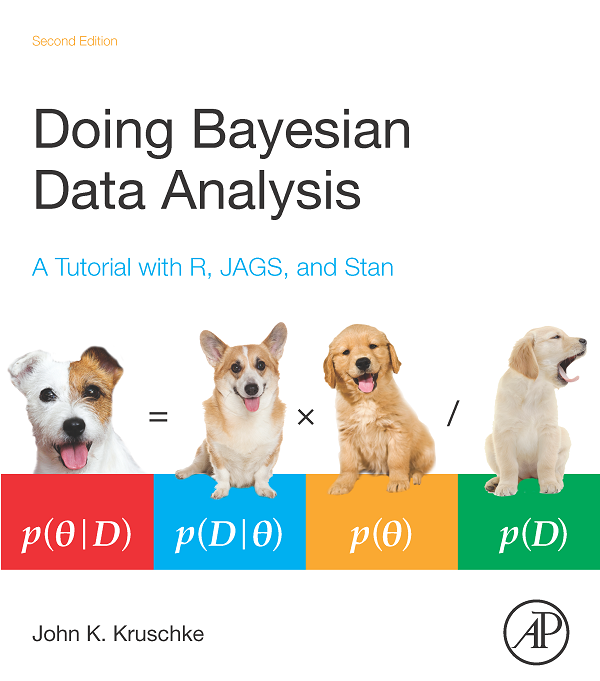 John has a blog post on the topic at http://doingbayesiandataanalysis.blogspot.com/2012/05/how-to-report-bayesian-analysis.html. This has a reproduction of the first part of section (23.1) on "Reporting a Bayesian analysis" from Kruschke, J.K. (2011) Doing Bayesian data analysis: a tutorial with R and BUGS Elsevier, Amsterdam etc. The main points are summarised in Kruschke, J.K., Aguinis, H., & Joo, H. (2012) The time has come: Bayesian methods for data analysis in the organizational sciences. Organizational Research Methods, 15, 722-752 in the section "Recommendations and Illustration of How to Report Bayesian Analysis Results", where they also give an example of writing up a regression analysis. Also Kruschke, J.K. (2013) Bayesian estimation supersedes the t test. *Journal of Experimental Psychology: General*, 142, 573-603 has a section on "Reporting the results of a Bayesian analysis". You would need to cite that paper as the description of the methods for robust Bayesian analysis. In my own field (wildlife ecology) we can rarely do experiments, so hypothesis testing is scarcely relevant anyway. The focus is on estimation (of density, abundance, occupancy, survival, etc) or on modelling. In the latter context, information theoretic approaches (using Akaike's Information Criterion, AIC) have been the norm, and moving from there to a Bayesian approach is relatively painless. So I can't point you to papers reporting a Bayesian analysis of ANOVA-type data; Marc Kery's book, An Introduction to WinBUGS for Ecologists (Academic Press, 2010), shows how to do this, but not how to write it up. I've recently started using BEST and have found it easy to set up and play with. However, I have a question about the 'parallel' option. I would like to run BEST with more than the 3 cores BESTmcmc appears to be defaulted too. Is there a way to run BEST on the nCores-1? Or to choose the number of cores that I can run BEST on? nChainsDefault = 4 # because JAGS has only 4 rng's. nChainsDefault = 3 # save 1 core for other processes. Ahhh! Thanks John - I didn't realise that would happen in jags, and it makes sense that the default for BEST would match that. I'll have a look at the runjags manual to see if there is a simple workaround. I'm just following up with a new question - i'm new to Bayesian Analysis, so apologies if i've missed something obvious, but is there a methodology for testing the difference of non-symmetric distributions? For example, how would I go about comparing the skewness of two distributions to see if they are different?